ake your role-playing fantasies to the extreme with the Fetish Fantasy Extreme Hannibal Mask. This soft neoprene mask contours to the face and features a thin eye slit for limited viewing. 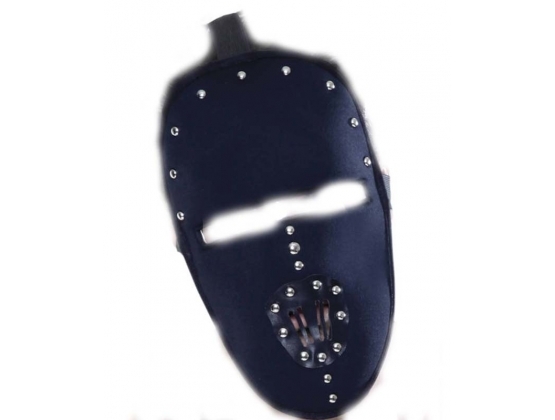 Small metal rivets adorn the top and mouth of the mask, which has four slits of vinyl for easy breathing and restricted speaking. The vinyl muzzle prevents your subject from using their mouth for anything but speaking your dinner date just got a lot more comfortable knowing that you're NOT on the menu! The mask has two elastic bands that easily adjust to fit most sizes, and it's perfect for beginners who aren't yet ready for the intensity of a full-faced mask or hood. To clean, hand wash gently using mild detergent and warm water. One size fits most.